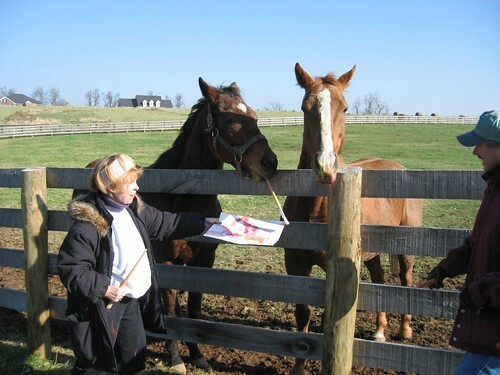 Mary Simons, aka “Moneigh” Mary, arrived at Old Friends last Monday with her painting supplies to assist our dowager mare Bonnie’s Poker, dam of the great Silver Charm – or the “other” Silver Charm, as we think of him at Old Friends – create a masterpiece. At first Bonnie wasn’t in a creative mood. She took off as soon as Mary started unpacking her paints, and ran around the paddock like a 2-year old, followed by her friends Narrow Escape and Cozy Miss. While waiting for Bonnie to cooperate Mary enticed Affirmed Success and Futural to break their “Moneigh” maidens. It didn’t take much persuading. Both geldings were curious. They leaned over the fence and got right into the paints, smearing it artistically on the paper and all over Michael’s jacket. Then – this was a surprise – Futural took a brush between his teeth and applied a few distinctive strokes. Not to be outdone, Affirmed Success did the same. Eventually Bonnie slowed down. Michael produced carrots and, after skeptical look or two, she approached the fence and started munching. Mary was ready with paints – non-toxic children’s fingerpaints – and paper and, with the help of some more carrots, Bonnie was persuaded to stick her nose in the paint and apply it to the paper. Her carrot-assisted art will be framed and auctioned at the Thorobreds’ Christmas party. 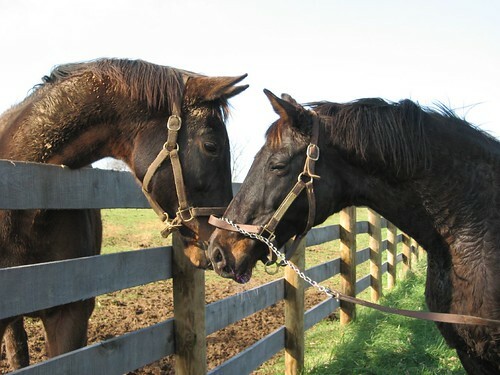 The Thorobreds are an organization of women in the Thoroughbred industry who raise money for horse-related charities. “Moneigh” is a registered trademark of ReRun, the Thorougbred rescue and re-training organization. IMG_0280, originally uploaded by oldfriendsblog. Tagged as Mary, Pleeaase hold that Moneigh™ paper still! Bonnie’s Poker and Kudos, originally uploaded by oldfriendsblog.